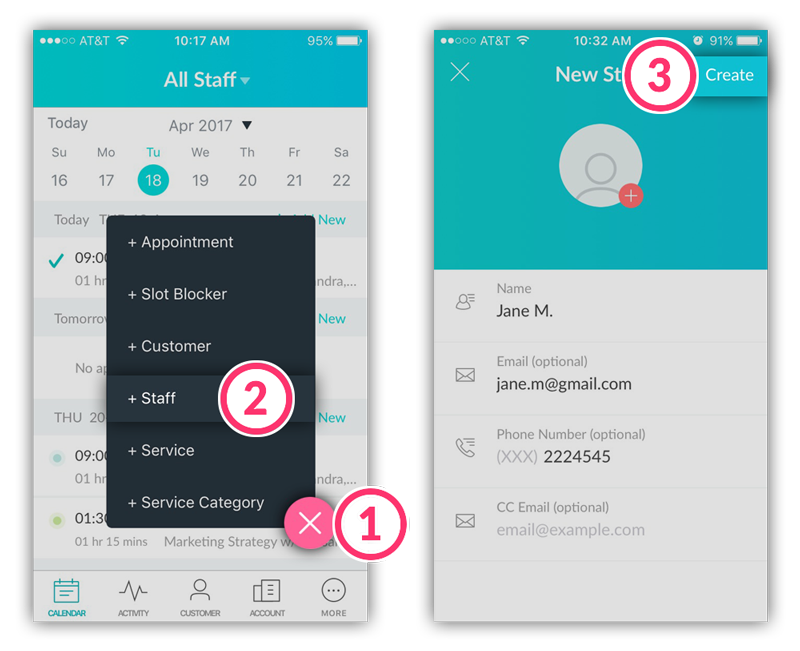 Staff members are your service providers, and when you add them to Setmore, each one will have their own calendar for scheduling appointments. Here’s how you go about adding staff members to your Setmore account. Tap the pink (+) button in the bottom-right corner. Fill in the staff member's name, email address, phone number, and upload a profile pic. Then tap the Create button in the top-right corner. You will then be prompted to set the staff member's working hours, break times, and specify which services the staff member can provide. When everything looks good, tap the Done button in the top-right corner. Note: Staff members must have services associated with their profile in order for you to book an appointment with them. In the bottom navigation menu, tap the Account button. In the Account menu, tap Staff. Tap to select which staff profile you wish to edit or delete. In the Staff Details menu, tap their profile picture, name, services, working days, or break times to edit each element. Be sure to save any changes you make by tapping the Save button in the top-right corner. If you wish to delete a staff member, tap the three dots (...) in the top-right corner and select Delete Staff.